Right it is that time that I am sure some of you have been waiting for, today we are going to be revealing our top tips about those pesky fasteners that lots of people are a little scared of... Zips. Warning its going to be a long post so go and get a cuppa and we will get stuck in. What kinds of zips are there? Nylon Dress/Skirt are the most commonly used. Don't be put off using these in soft furnishings (cushion covers) and craft projects though, it simply refers to the weight of the teeth. They are light weight and durable with metal runners and usually come in a wide selection of colours. They have a metal or nylon stopper at the bottom. Concealed or Invisible zips are used predominantly in clothing for their hidden appearance, or rather lack there of, Light weight and inserted (usually with a specialist foot) so that the opening simply appears to be another seam. With a narrow light weight coil to the inside of the garment, a dainty metal runner and droplet tag they are perfect for evening wear. If used on very light weight fabrics like chiffon they do have a tendency to get fabric caught in the runners and given their delicate nature, can split if put under too much strain. Open Ended zips are a section all to them selves as there are a few different types, You can have them in different weights (light weight to chunky to metal) and teeth in different materials, but the one thing they all do is split completely in half. Imagine the front of your hoodie or rain jacket, the zip has a metal or plastic slot on one side where you place the end of the other side before pulling the runner up. This slot enables the teeth to level up before joining together and for the zip to come apart. Metal zips are the most hard-wearing of zips and come in short lengths for jeans and work-wear and longer open ended versions for waxed jackets and heavier garments. Decorative or exposed zips are a relatively new idea, usually the tape that hold the runners is printed or edged in some way and designed to be shown on the outside of the project or garment, rather than being hidden n the inside. There are of course lots more variations, but these are the main ones that you will come across. 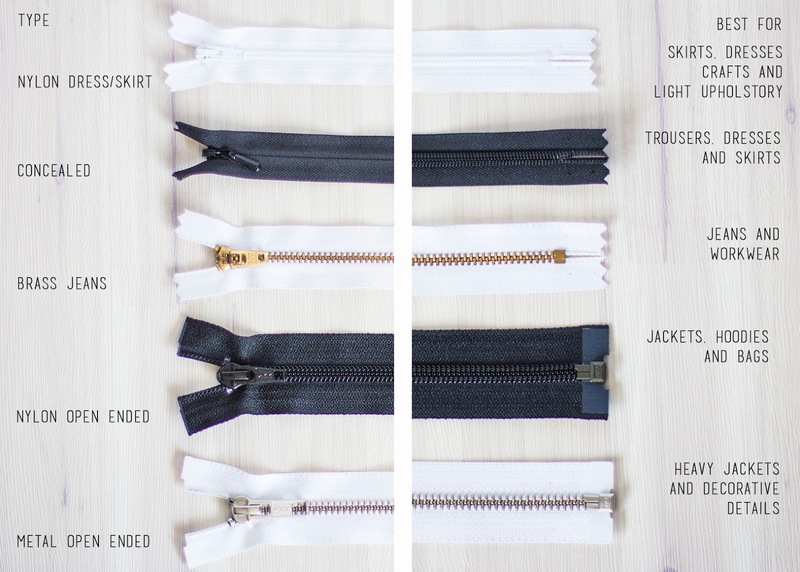 How do you choose the right zip for your project? 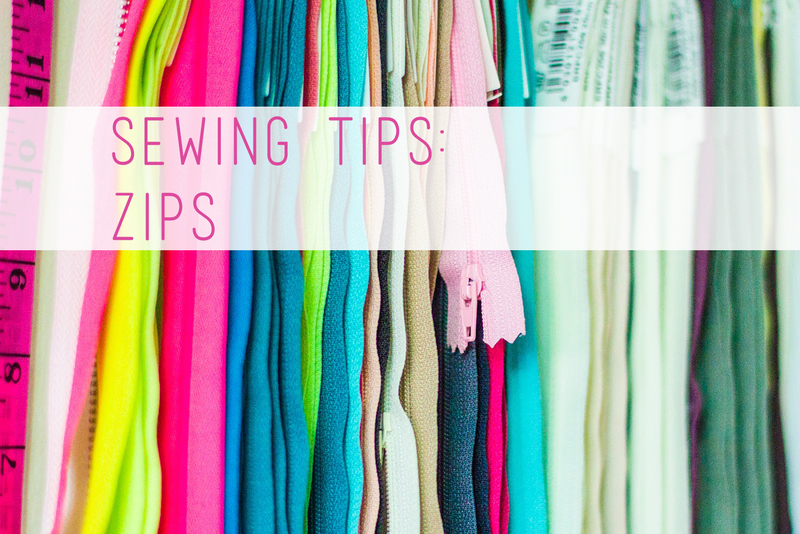 It can be confusing when you are faced with a wall of zips at your local haberdashery, or pages of choice online but most of the time you can find the information you need in your pattern. If not there are some simple ways to decide which type of zip would be best for your project. Measure your project before you go to buy your zip. They can be cut down to size, but you don't want to buy on that is too short. 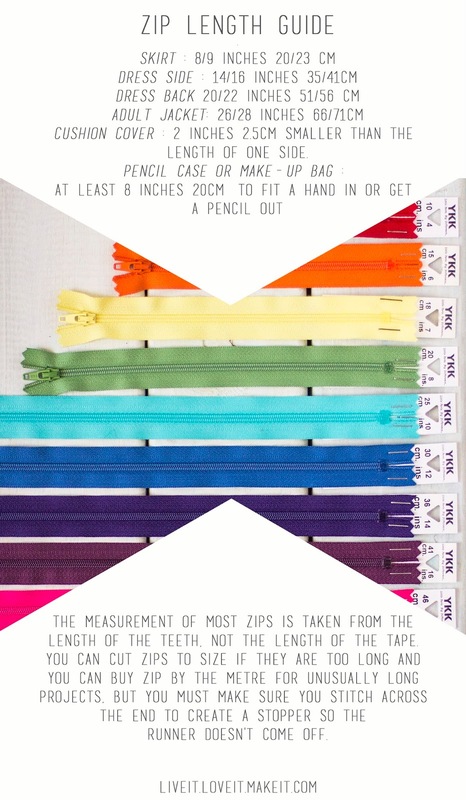 Think about the weight of fabric you are using and choose the weight of zip accordingly. Do you want the zip to be hidden or on show as a feature? if you are nervous about making a neat job, pick a decorative zip to take attention away from wobbly seams. 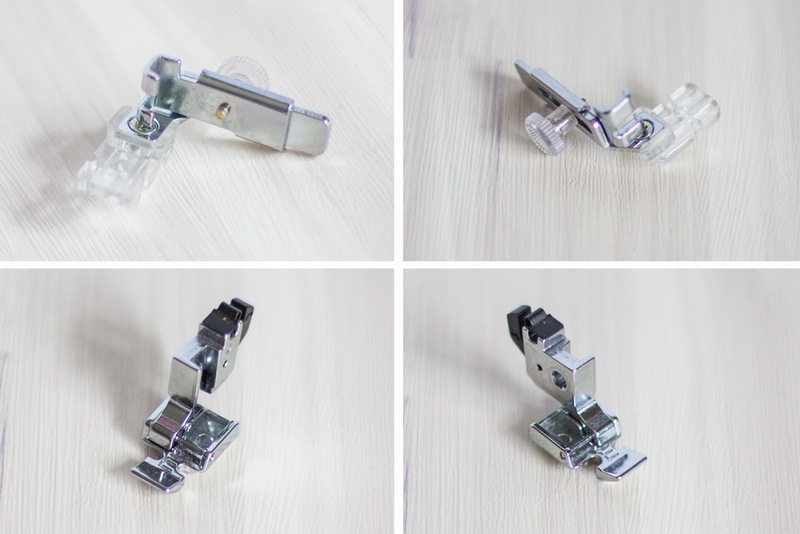 Do you need a special foot on your sewing machine? You don't NEED a special foot, but it does help when sewing in zips using your sewing machine to have a zip foot or a concealed zip foot. The zip foot shifts from side to side to enable you to get as close to the zip teeth as possible. Whilst the invisible zip foot helps to ease open the gap under the teeth where the stitching will go and be hidden from view. Do you have to sew them in with your sewing machine? Not at all, if you are nervous or unsure of sewing something tricky with your machine, you can stitch in your zip by hand. Some times it is easier, when replacing broken zips, to sew it in by hand. My pattern said to put it in this way, but I would rather do it differently, is that Okay? Sometimes the person who has designed the pattern has given the style of zip for a aesthetic reason, for instance a side zip on a pair of trousers without a waist band will most likely ask for a concealed zip, in order to keep the look of the hip and waist area as smooth as possible. In this case it is up to you, have the choice to change it to a regular one if you feel the look is not so important to you i.e. if you will always wear them with a top that covers the zip. However occasionally the zip is chosen for a practical reason, for instance strapless bodices will often call for an open ended zip in order to be able to get in and out of the garment whilst getting a super fitted finish. In this case it would not be a good idea to alter what the designer has requested. Take your time. Don't rush putting in a zip, and don't do it when you are tired, it' never going to end well. Tack it first. If you can tack it in by hand first, it will give you a guide and help to stop it from moving round as you stitch. Use quality product. As we always say with haberdashery, you get what you pay for, use the best supplies you can afford. Use existing garments as a guide. If you are unsure of how it is meant t look, or if it is the right place, check on a piece you already own to give you a clue. Practice makes perfect. If you see some cheap zips at a car boot or charity shop, pick them up and use them to practice, particularly using your zipper foot, or invisible zipper foot on your machine, with out the pressure of completing a project. I hope that has cleared up some of your questions and maybe given you a little more confidence when thinking about tackling zips in the future. If you have any questions that I haven't answered in this ask me in the comments and I will do my best to answer them.